If anyone has been following this blog for a time, you will remember about a year ago I fished with Steffen from the Sexyloops board whilst in New Zealand. We fished for a week with limited success on a particularly heavily fished river – Steffen Part 1. Apart from the lack of fish landed for a week’s fishing we had a great time and a few weeks ago Steffen informed me of his plans to come over to Scotland to fish for 10 days. He arrived on the 1st of September and we set off the following day. I should warn you now, this is going to be a long one. 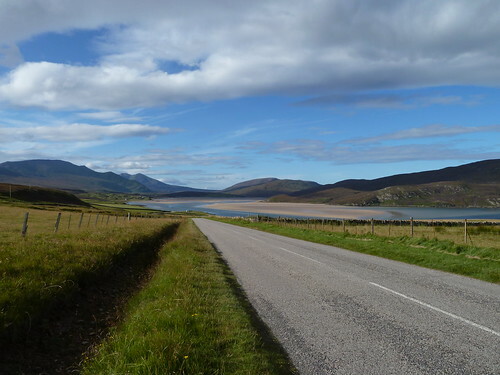 First plan was to head to Durness to fish the limestone lochs, an adventure for the both of us as neither had been there before. 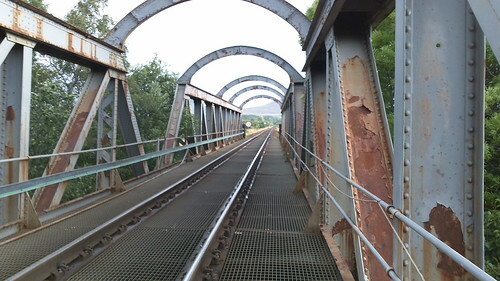 In fact, much of this trip was an adventure in this regard. The weather on arrival was windy with the odd rain shower so we decided to sleep in the car that evening after a few beers. We awoke bright and early, set off for permits and by mid morning were on the edge of the loch which greeted us with a promising first sight. 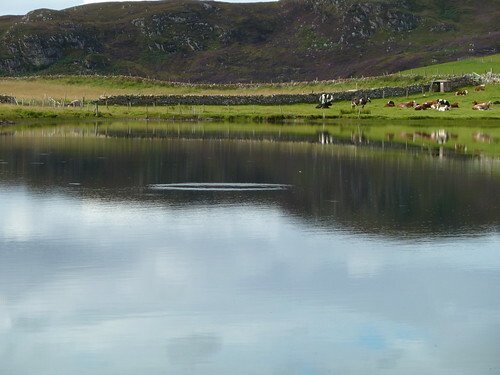 The loch was flat calm with a good number of rising fish and we quickly set about stalking them. 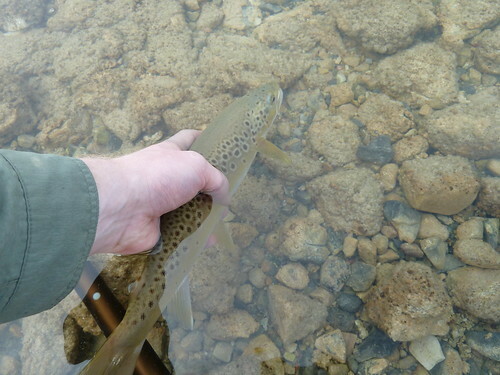 My first attempt at a fish saw me into a spritely half pounder to a small cdc and elk that was promptly released. Not long after I was into a slightly better stamp of fish, again a lovely trout around a pound. 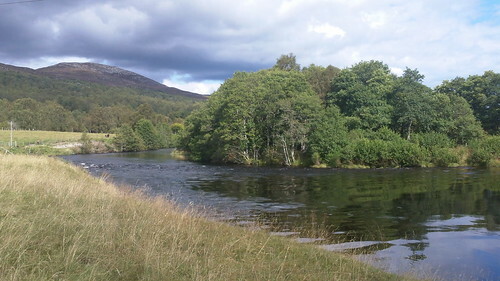 The trout from this loch are quite spectacular, bright silver in colour with yellowish fins – absolutely gorgeous. Next fish of the day went to Steffen. We were spotting from a high bank where we could see the fish quite deep in the water coming up through 3-5′ to take flies from the surface. Steffen opted to go with a klinkhammer and managed to connect with 2 fish around 2lb but unfortunately lose them. I then proceeded to do exactly the same with the next fish! By this time the wind had gotten up quite a dramatic amount and after briefly fishing down the side of the loch we wandered over to another. Nothing much to report other than the fact we saw a couple small fish and came back to loch number one. By now the wind was howling and there was nothing for it other than a sinking line and streamer fishing. We had done our spell of dry fly purism for the day, it was now time to wake them up with something a bit more instrusive. I opted for an intermediate line and a fly I’d never used before, an Ace of Spades. Strange choice for me as I’ve never been one for traditional flies but it proved pretty darn effective. I was quickly into another fish, it tipped the scale at 2lb but there is one issue with this fish… In the age of the internet a fish wasn’t actually caught if there is no photograph so you’ll have to make up your own mind of whether this was imaginary or not. All I know is I dropped the fish into the water as I went for the camera, or did I imagine that? Shortly later I was into another fish, it certainly felt bigger, seriously good bend in my rod but alas it slipped the hook, leaving me with a slack line and that feeling of wonder. Steffen had the same luck with the streamer, on and then off again. By now it wasn’t yet evening and the wind was too strong to make it enjoyable so we respectively retired to the campsite. 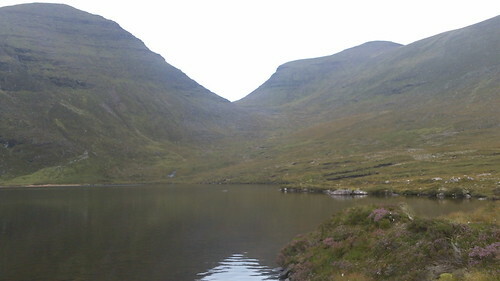 What a lovely loch though. The view on the walk back. 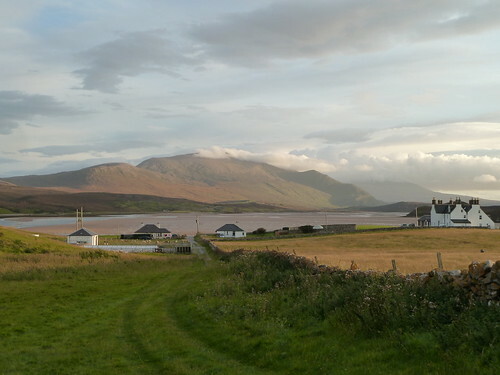 The following morning we took a few pictures and then set off down towards Assynt to fish a hill loch. Day two fishing up in the hills was quite interesting. I rose 6 or 7 fish and ended up with none on the bank, one of those days! Another strange thing is there were no fish moving in close to the bank, they were all fairly far out. The wind came and went during the day, the flat calm periods giving you a good chance to target risers and then it went totally calm for the remainder of the day. To sum up a few things, I dropped my camera in the loch, I got cold wet wading and Steffen had his first major encounter with midgies. One of the most entertaining moments came as I was standing knee deep in the freezing water stalking a fish I had seen head and tail a couple times. I had cast in front of where I thought it was and waited, and waited, and….. “Argh!” Steffen had walked in a bit too deep and gotten his foot wet at which moment I turned my head and the fish decided to take. Of course I missed it and the pair of us burst out laughing. The hardship endured for that fish to miss it like that was just nothing more than comic value. I think it was a nice fish, perhaps a pound and a half. It certainly had a good sized back on it. Steffen won this day, landing a couple trout to my zero and we set off down the hill with the intention of driving South to Ullapool for a chippy and a pub visit. Most pictures from now on are from my video camera hence the quality. From Ullapool we set off for the River Moriston which turned out to be nothing more than a big swollen hydro channel, a bit disappointing really although we did see two very nice Salmon. 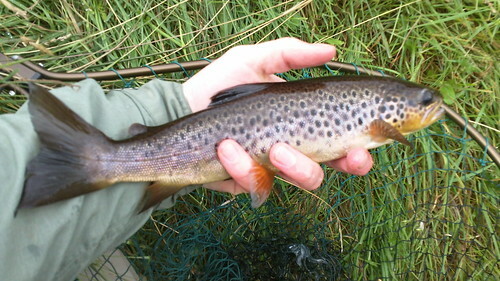 I managed 2 small trout out of a pool below Dunreggan Reservoir and that was it, not exactly excellent fishing. 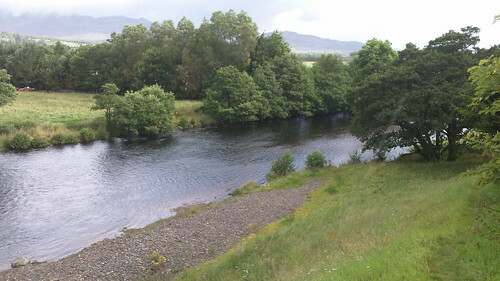 From the Moriston we drove to the upper reaches of the River Spey where once again we came across relatively high water, although on this occasion it was much, much more fishable. We were both quickly into fish getting good sport on the dry fly and wet fly but nothing of any size to write home about. 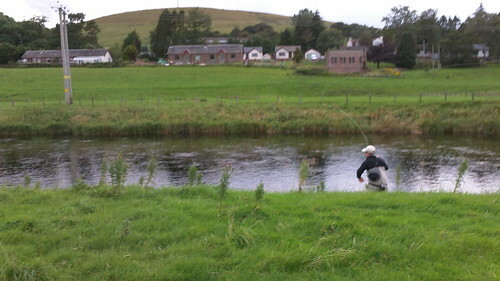 The weather this day was appalling, not fly fishing weather in the slightest. It was grim, horrible winds and horizontal rain. At the end of the day we did a quick bit of streamer fishing and I picked up this fish of modest size but what a tail on him! 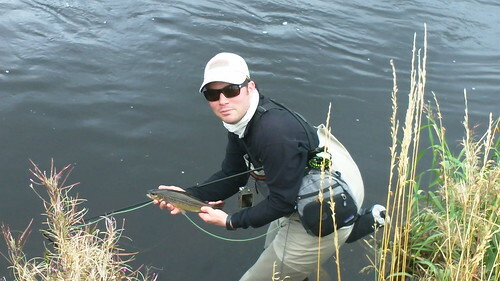 It was then home time for me as I had to work a day at the university so Steffen went to fish a Southern river that day. He managed a few fish around 12” in what sounds like terrible water conditions fishing both dirty and high water. For the next two days we fished another local river with limited success. 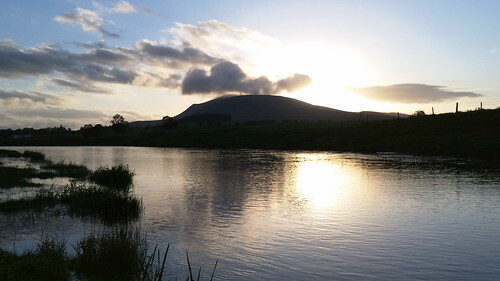 On day one the water was relatively high but still fishable and eventually we found some rising fish in the early evening. Steffen managed two fish that day and I blanked. We chose to fish a different stretch of the river the following day and on the second cast of the morning Steffen hooked into this nice trout on a partridge and orange. The fish were in an obliging mood in terms of rising for most of the afternoon and certainly into the evening but I could not get any to stick. I managed to rise 3 fish and missed them all – just one of those days when things don’t go your way I guess. In the evening the fish were rising all over the particular river flat we had chosen to stay at but for the life of us we couldn’t get them to take. There were big fish around 3lb moving, I was watching the buggers head and tail right beside me but they just weren’t interested. As Steffen quoted Gary Borger – “On a scale of 1 to 10, drag is a thousand” and after discussions with other friends I have come to the conslusion that drag is indeed a thousand and it was that thousand we were lacking that evening. Downstream pile cast will be the weapon of choice next time out. That was the end of Steffen’s fishing trip, certainly mixed results but we both thoroughly enjoyed it, consumed a few beers and had a good laugh. The fishing had been majorly effected by the weather but we persevered and did our best given the conditions. To be honest, some of those days were the worst weather days I have fished in. For the last night we went into Glasgow for a couple pints and had the unusual pleasure of joining an older crowd in one of the plusher West end Bars!!! Thanks for coming over Steffen, was great to catch up again and I hope we get to fish again soon. Maybe NZ again?! With Steffen having left early on Sunday morning, I watched the rugby world cup games and then set off for the first BFCC event in Scotland taking place in Glasgow. It was a great day in terrible weather but that did not deter the numbers nor the level of casting on display. The news has since told us it was the tail end of Hurricane Katia that was out to try and spoil the day. In spite of the weather the competitions were hotly contested and Malcolm Prescott and William McGuire of our very own Glasgow Casting Club did incredibly well picking up a trophy each in the T120 and #9 weight competitions respectively. The instruction freely given to me in particular by John Reynolds, Mike Heritage, Ben Dixon and Mike Marshall was gratefully receieved and I look forward to putting it into practice! Just happened upon your blog. A bit long and wordy but I have to say that your photography is simply STUNNING. Beats my little holiday snaps hands down. Amazing!